Here are some basic split airconditioner control troubleshooting guide that may help you to understand more of the electronics control of your equipment. This is a non-inverter type of control. Take note that you need to have a good electrical knowledge to do this as the power supply to the printed circuit board is LIVE. It is always a good practice to disconnect and isolate the power supply when you are troubleshooting the control board. If you are not sure, get a qualified technician to check your unit. A split air conditioner is also commonly known as ductless split or mini split where there is an outdoor unit and an indoor unit. The outdoor unit consists of a compressor, a fan and the condenser. This is the place where heat from the indoor is transferred from the indoor to the outdoor and is rejected to the surrounding. The indoor unit basically consists of an evaporator, an expansion valve and a fan. Copper pipes are used to connect the flow of refrigerant between the indoor unit and the outdoor unit. The power input can come from the indoor unit to the outdoor unit. The non-inverter split air conditioner basically consists of a ON/OFF compressor where the compressor is either ON fully or OFF fully. The inverter based compressor can regulate the speed of the compressor depending on the load required. Here is the breakdown of the typical controller for better understanding. 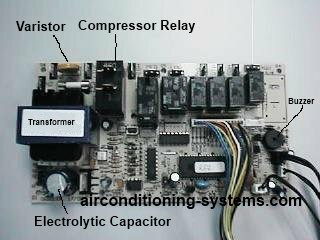 The main control board can be divided into input power supply, a microcomputer controller integrated circuit, temperature sensor inputs and outputs to control the compressor, indoor fan speed, outdoor fan speed and air swing. The AC input from the mains has to be converted to DC voltage where it can be used to power the integrated circuits and drivers in the electronics circuit. There are two ways to do this. One is by using a step down transformer where the AC voltage is stepped down to voltage such as 25V AC or 12V AC. This voltage is then converted to DC by the use of diode bridge as rectifier and electrolytic capacitor to smoothen the rectified voltage. A 3-pin voltage regulator is used to get a fixed 5V DC or 12V DC power supply. This low voltages are used to power the microcomputer, DC relays and other integrated circuits in the circuit. A simple linear power supply circuit. The other method is to use switched mode power supply or SMPS which makes the dimension of the printed circuit board smaller as the bulky transformer can now be replaced with a smaller transformer. This design is becoming more common as the quest for smaller space is becoming more critical. There is usually a surge absorber or a varistor connected across the input of the power supply. This device acts to protect the internal circuit in the event of lightning or power surge. When the power input to the device exceeded its voltage rating, it will clamp the voltage by bypassing it to the input source. This is one device that can be easily damaged if the power surge or lightning occurred beyond its maximum rating. A fuse is placed in series with the input power supply to cutoff any overcurrent or short circuit that happened in the circuit. This is another protective device used in most electronics circuit. It has to be replaced once it is blown. In order for the handheld remote control to send the settings to the controller at the air conditioner unit, there is at least an infra-red receiver printed circuit board that receives the signals from the handset. This receiver is usually located in front of the indoor unit and can be identified by a specially made sticker that allow infra-red frequency to pass through. Also known as handset, this is where you can control the air conditioner settings remotely by pointing your handset towards the air conditioning unit. Temperature, timer, operating mode, energy saving function, air swing direction, fan speed, ionizer and sleep mode are some of the functions that are usually available depending on the manufacturer of the unit. Here is a list of split airconditioner control troubleshooting guide that you can use if you need to troubleshoot your split air conditioner unit. When troubleshooting, make sure mains power is disconnected before proceeding to check the printed circuit board to prevent electric shock.